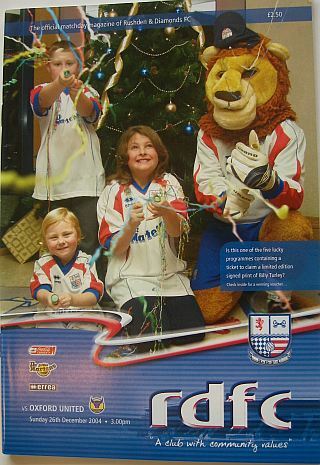 During the 2004/05 season Rushden & Diamonds reached the milestone of their 700th game. A great deal had happened since Game 600. Promotion from Division 3 to Division 2 was followed by Brian Talbot’s resignation as manager after the home defeat to Peterborough United on 6 March 2004 (game #661). Ernie Tippett had taken over after a caretaker spell from Barry Hunter, as Diamonds slipped back into the renamed Coca-Cola League Two. This game was Tippett’s 31st in charge, the previous matches comprising 6wins, 7draws and 17defeats. Diamonds were languishing in 21st place with just Shrewsbury Town, Cambridge United and Kidderminster Harriers below them. Oxford were also struggling, just 4 points ahead in 18th position. In the few days before Christmas, the club had announced the suspension of long serving keeper Billy Turley after his indiscretions, and he was never to play for Diamonds again. Lee Worgan deputised and was making his League debut. Former Diamonds in the starting line up for the visitors included Leo Roget and Barry Quinn and the game proved to be an entertaining affair, with plenty of goals. Oxford scored first when Jamie Brooks made a surging run forward and crossed for Chris Hackett to fire home from 6 yards. Leading goalscorer Craig Dove levelled the game on 37 minutes after firing a low shot past keeper Bradie Clarke from 18 yards, but just before the break, Oxford went in front again when Lee Bradbury volleyed home after Diamonds had failed to clear a corner kick. Within six minutes of the restart however, Diamonds were level again as David Bell’s shot from the edge of the area beat the Oxford keeper at the near post. Rob Wolleaston made a substitute appearance for the visitors on the hour, but within two minutes of his introduction, Jason Taylor (who had replaced the injured Gary Mulligan in the first half) put Diamonds in front, heading home Bell’s cross at the far post. Some poor defending allowed United a share of the points as Craig Davies equalised some 13 minutes before the end. Tippett’s days at the club were numbered, and he was in charge for just five more games before the appointment of fans favourite, Barry Hunter. Team: Lee Worgan, Peter Hawkins, Graham Allen, Rob Gier, Alex Hay, Stuart Gray, David Bell, Andy Burgess, Andrew Sambrook (Sean Connelly 12), Craig Dove, Gary Mulligan (Jason Taylor 12). Goals: Chris Hackett 14 (0-1), Craig Dove 37 (1-1), Lee Bradbury 42 (1-2), David Bell 51 (2-2), Jason Taylor 62 (3-2), Craig Davies 77 (3-3).